Common Names: Curry Leaves, arbre à feuilles de curry (French), Curry blattbaum (German), Curry orangenrauten (German). Like bay leaves, curry leaves are fresh or dried aromatic leaves used in cooking, to flavour food. They are best used fresh. Unlike bay leaves, which are added to food and later discarded before serving, curry leaves are wholly edible so don’t need to be discarded after cooking. They are an important ingredient in South Indian Cusine. The aromatic leaves come from the Curry Leaf Tree (Murraya koenigii), a native of India and Sri Lanka. In North America you can find the leaves in Indian or south-asian grocery stores. The flavour is described as slightly bitter and sweetish with a pungent aroma, almost like lemon grass. Always choose bright, glossy, dark green leaves, without signs of browning, bruising or wilting. They should have a pleasantly pungent aroma. Curry leaf is an indispensable ingredient in southern Indian cuisine. They are either used whole or torn into pieces to intensify their flavour and aroma. Curry leaves are added in the first stage of cooking, along with chopped onions, sizzling them in hot oil and then the vegetables, rice or poultry or whatever is being cooked is added. The leaves are usually fried in a little oil, with brown mustard and chilli powder until crisp and brown, and then the hot seasoned oil is poured over lentil dishes. This process is described as tempering dal. 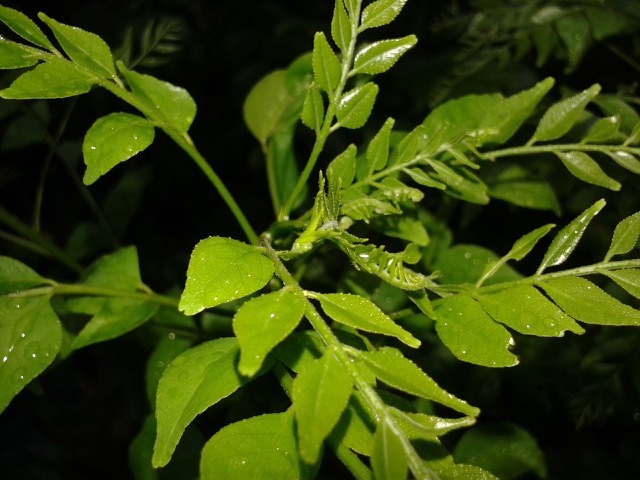 Curry leaves are also used to make relish, curry leaf sambol (a condiment) or chutneys.They can also be used in in breads, drinks and cocktails. In Malaysia and Indonesia, curry leaves are popularly used in Fish curries. The leaves may also be dried and ground into powder which can be used as a garnish for a martini or sprinkled over boiled potatoes and other dishes. The best aroma is from fresh leaves. Fresh curry leaves can last up to two weeks in the fridge.The fresh leaves give the best flavour and aroma. You can also freeze the leaves in an airtight container for a couple of weeks. The flavour and aroma will eventually diminish. To make them last longer, air-dry them and store in an airtight container, but note that the aroma and flavour of dried leaves is inferior. The leaves contain 2.6% essential oil used in the soap industry. The curry leaf tree is a small aromatic evergreen tree 3-6m high. Leaves are compound with about 10 pairs of leaflets, gland dotted. Flowers small, white in clusters. Fruit, are berries that turn red when ripe. Posted in Glossary, Spice, What is?